Heroku Toolbelt on Mac OS X is quite easy to run than Windows. It does not require commands to get installed. Here is how you can use Heroku Toolbelt on Mac OS X. As many users are upgrading to Ubuntu 12.04 (or even 12.10) or Mac OS X (from search data of this website), may be for security, better software support, better look than Windows 8 and most importantly, faster performance than Windows, we are also gradually updating the usages according to the searched tutorials and guides users are seeking for. We already wrote guides on Heroku Toolbelt both for Windows and Linux (read Ubuntu), this time we are updating our Cloud Series Guides with this Heroku Toolbelt on Mac OS X guide. Heroku Toolbelt on Mac OS X : Why to Use Heroku ? If you are asking this question, why to use Heroku Toolbelt on Mac OS X, as a new user, then the answer is – use the search function of this website – search with Heroku Cloud and it will be obvious to you that, Heroku Cloud is a free thing and you can do practically anything, like installing WordPress on Heroku Cloud, fully free of cost. Add the advantages of Heroku Cloud (Free Cloud) with Custom Domain Name. And if you are an advanced user, the answer is more short – if you use Heroku Cloud as hosted app through Facebook – the SSL certificate is fully free. When you will use Mac OS X, the pakage will be highlighted. Download it. As shown in the screenshot, this is the first step. Next is better if you have iTerm2 or you can use default terminal. We provided needed guide for iTerm2 here. 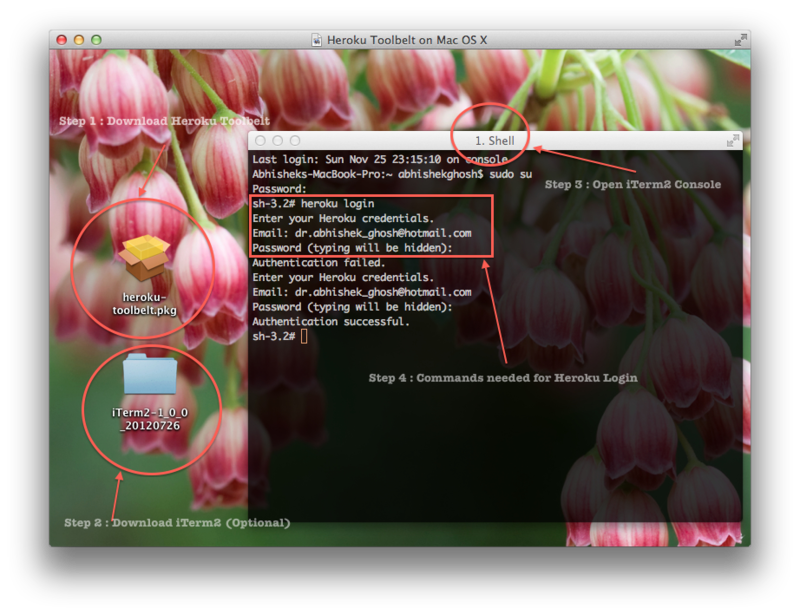 Third is just to run the heroku login command, which is universal in Windows, Linux and Mac. Obviously, there is no difference in commands. This Article Has Been Shared 7016 Times! Top 10 Cloud Storage in 2013 lists the major cloud services for online storage, backup, and interactive use in 2013. Often the providers offer extra features. your content seem to be running off the screen in Firefox. to let you know. The design look great though! Hope you get the problem solved soon. Cite this article as: Abhishek Ghosh, "Heroku Toolbelt on Mac OS X : Use Heroku Cloud in Two Steps," in The Customize Windows, November 25, 2012, April 26, 2019, https://thecustomizewindows.com/2012/11/heroku-toolbelt-on-mac-os-x-use-heroku-cloud-in-two-steps/.